This was among more than a dozen works Tyler Sidebottom completed with UCHealth art therapist Amy Jones during his long inpatient stays at UCHealth University of Colorado Hospital. Tyler Sidebottom was an athlete. As a kid, he led his Rock Springs, Wyoming little league team to California, where a group of kids from a town 20,000 held its own in the northwest regional Little League World Series semifinal. By the time he was a high school senior, he had a big-league body 6-foot-1, 245 pounds. Football was his sport then, and he led Rock Spring High School to a Wyoming 5A state championship in 2001. He was an all-state linebacker and offensive lineman – named the best offensive lineman in the state, even. It earned him a football scholarship to Chadron State College in Nebraska. The summer before he was to start his adult life, he and some friends headed off to go camping and four-wheeling near Jackson, Wyoming, over Fourth of July weekend in 2002. One of the four-wheelers got stuck in a creek. The next morning, Sidebottom and a friend were up early and rode their ATVs out to dislodge it. They needed tools they hadn’t brought, they realized. Sidebottom headed back to the campsite to fetch them – maybe a little bit too fast for unfamiliar terrain. He went over a 15-foot cliff. Exactly what happened, Sidebottom doesn’t know. Hikers came across him sometime later and dragged him out of the gulch. He was airlifted to a hospital in Idaho, and then flown to Shriners Hospital for Children in Sacramento, California. His mom, raising three kids on her own, had no health insurance. But a month before the accident, Sidebottom had played in the North-South Wyoming Shrine Bowl, a high-school football all-star game benefitting Shriners Hospitals for Children. They took him in despite his having turned 18 a few months earlier. They told him what he already knew: he would never walk again. This is a last-resort, radical operation that removes everything below the waist. UCHealth orthopedic surgeon Dr. Bennie Lindeque led the team of surgeons who performed the main operation (there were preparatory surgeries, too) in September 2016, with six follow-up surgeries through that October. In May 2017, he was back again, this time for surgeries led by UCHealth plastic surgeon Dr. Frederic Deleyiannis. Sidebottom had by then endured somewhere around 50 surgeries since the accident. He had been in hospitals so much that he referred to himself as “professional patient.” Physical pain was a too-loyal chaperone. But there was psychological and emotional pain, too. That’s where a philanthropically funded program UCH launched right around the time of Sidebottom’s hemicorporectomy came to his aid. Tyler Sidebottom has been what he calls professional patient for 15 years. Art therapy and other non-medical therapies have been vital in helping him maintain his humanity. Dr. Jean Kutner, UCH’s chief medical officer, had launched it, though not in her official capacity. Kutner is a national leader in palliative care, which is about providing physical and mental comfort to patients who may survive, but who will never fully heal. Kutner’s mother Natalie, a health care social worker and artist, died in 2014. She had been a patient at UCH. To help other patients and to give back to the place that had cared for her, Kutner and her father decided to devote memorial gifts to the first year of the Natalie Kutner Palliative Care Creative Arts Program at UCH starting in September 2016. Ongoing contributions continue to support part-time art therapist and licensed professional counselor Amy Jones and board-certified music therapist Angela Wibben, each for 20 hours a week. The UCH Palliative Care team made the introduction. Patients can choose to do art or music, both or neither. With Sidebottom, Jones arrived with an art cart with watercolor paints, the makings for jewelry, colored paper as collage input, clay for sculpting, yarn for weaving tapestries and the like. She stopped by nearly every day, Sidebottom said. Sometimes, she dropped off supplies (Sidebottom preferred watercolors) for him to create with. Then the next day, she would stick around to explore about what he had created. There was a satisfaction in the creation itself, Sidebottom said. In his situation, preparing for and emerging from serious surgeries and being hospitalized for weeks at a time, life becomes a procession of long days that fade into lost weeks. One is alive but not living. Finishing a piece of art made a difference, he said. Just as important, he said, were his interactions with Jones. The “therapist” in “art therapist” is more than just a moniker. Art therapists are trained mental health counselors who use art-making, the creative process and psychological theory to facilitate communication. She might ask him about the details of a particular painting, or what he was thinking about when he was creating it. Or she might listen to what he was worried about, his hopes, his fears. She incorporates mindfulness and breathing techniques, too. Sidebottom’s own playlists and a portable speaker served as therapeutic music, but Wibben also worked with him to create a music playlist as an interpretation and emotional reflection of the art pieces. Each art work had a corresponding musical selection that matched the mood of the art and its message. In busy hospitals where physical health is the predominant focus, nurses and doctors rarely have time to delve into deeper emotional status of their patients. Psychologists and clinical social workers help, but the need can outstrip their capacity, too. In Sidebottom, Jones found a patient facing extraordinary physical challenges, but one with a profound understanding of the connection between mental and medical health and the importance of maintaining both for his greater well-being. His output – he created more than a dozen works in his month or so working with Jones – demonstrates that sensibility. On keychains he made with Jones’ help was a saying he had had tattooed on his calf when he was a teenager with no inkling of what lay ahead. 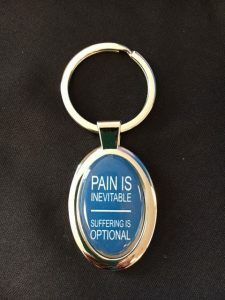 It read: Pain is inevitable; suffering is optional. It was the theme of one of his watercolors, too. 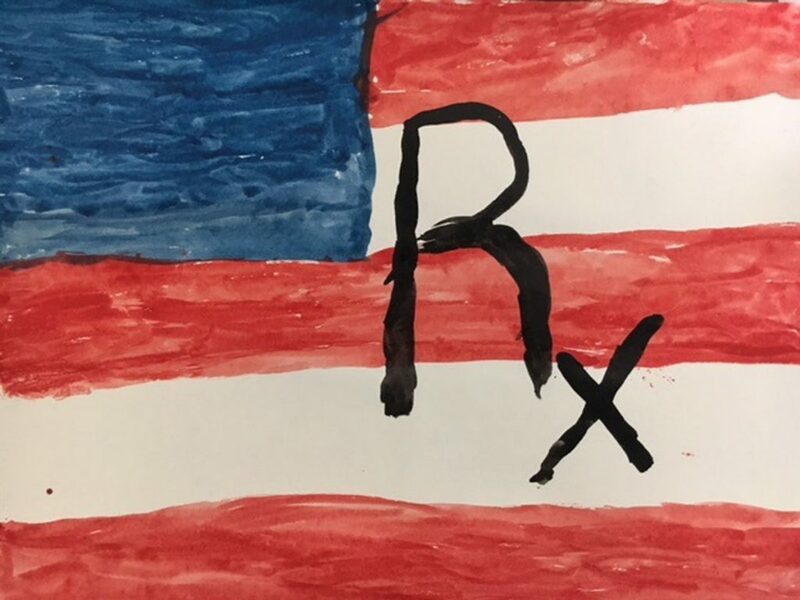 Others focused on his frustrations with his own care situation and, more generally, the health care system, such as one with a stylized American flag with the large Rx symbol painted across the red and white stripes. Art therapy can help patients in many ways. There’s the immediate enjoyment of creation and relief from monotony; there’s the opportunity for creative expression as well as an outlet for emotions ranging from hope to frustration and anger. Art is a vehicle for telling one’s story as a person, and not necessarily as a patient. And it can help doctors, nurses and other caregivers better understand a patient’s concerns and priorities. Sidebottom, who’s living with his brother Ryan’s family near Phoenix now, has continued to be in and out of hospitals, facing the inevitable pain. “I’m glad for every therapy – I feel like there should be more money in every single therapy, for lots of reasons,” he said, and he believes UCH’s example of providing art, music, and other therapies is one that, universally applied, could do much to help make suffering optional. Donate to the Natalie Kutner Palliative Care Creative Arts Therapy Program (Fund 0222843) via the CU Foundation, Mail Stop A065, 13001 E. 17th Place, Aurora, CO 80045 or visit the CU Foundation website.